Donald Trump’s victory, following a populist presidential campaign that split Americans along fault lines of race and gender, spurred events across the Seattle area as people struggled to cope. A Muslim Army veteran trying to comfort her kids. A Navy retiree rejoicing at the possibility of a new emphasis on veterans’ care. A woman approaching her 101st birthday who may now never see a female president, despite coming tantalizingly close. Across the Puget Sound region — one of the nation’s most liberal — residents grappled with the momentous events of Tuesday night: the stunning election of Donald Trump, who will become the first president in American history with no prior government or military experience. Trump lost Washington state, garnering 38 percent of the vote, according to Wednesday’s tallies. He got just 21 percent in King County and was losing every county that borders Puget Sound, save one. 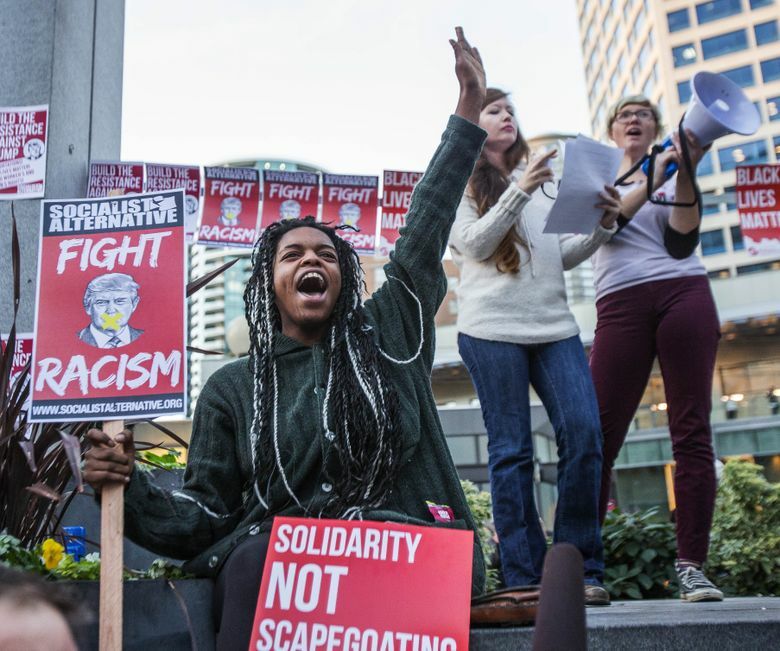 Trump’s victory, following a populist campaign that split Americans along fault lines of race and gender, spurred events across the Seattle area as people struggled to cope. 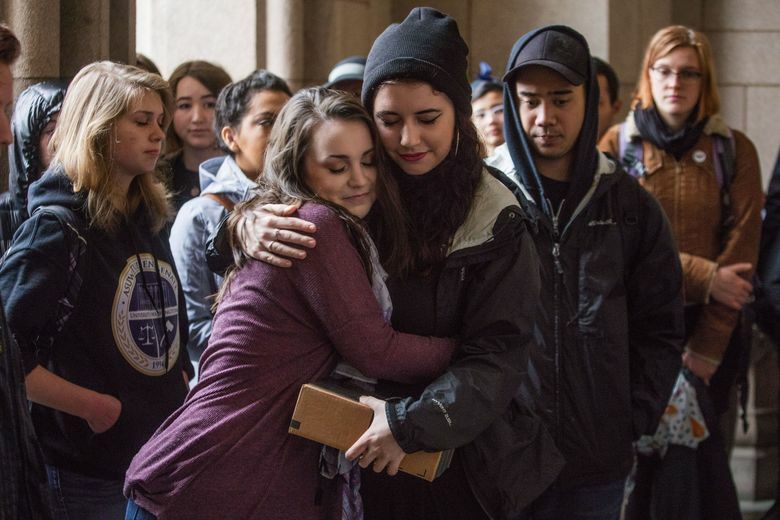 Mayor Ed Murray and the Seattle City Council held a rally at City Hall to reassure an anxious, weepy crowd that Seattle would remain a progressive bastion. Students at two Seattle high schools walked out of class to protest Trump’s win. 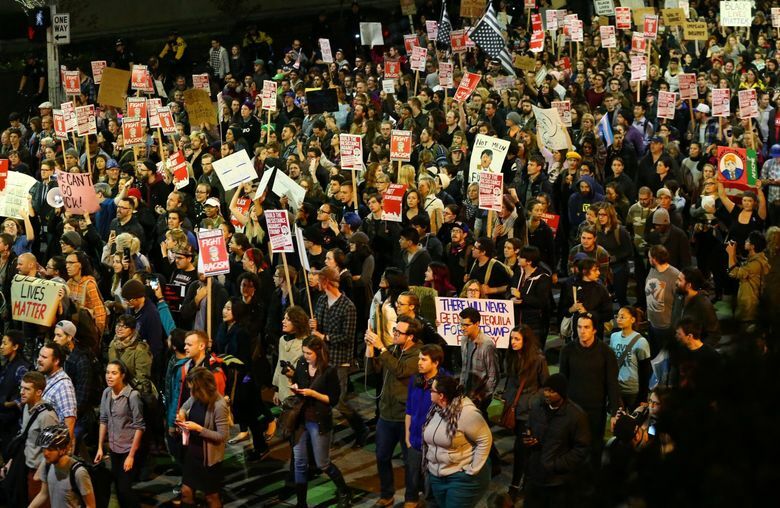 At the University of Washington a Trump protest vigil waxed and waned throughout the day and was still going as the sun went down. Hundreds of protesters gathered downtown at Westlake Center to oppose Trump’s agenda. Virtually every call to King County’s crisis hotline concerned politics. Even Trump supporters were surprised at his victory, which virtually no election forecaster had foreseen. John McDonald, of Edmonds, an insurance broker who voted for the winning candidate, was waiting for a ride at the UW light-rail station after arriving home from an early-morning flight. Waiting to get through the gate of Naval Base Kitsap in Bremerton on Wednesday, Paul and Ella Rohrer were ecstatic. “He doesn’t seem corrupt and it seems like he will take care of veterans,” said Paul Rohrer, who retired from the Navy and now works at the shipyard. “And our Second Amendment rights are safe!” added Ella Rohrer. After a Trump campaign that pointedly focused on immigrants and refugees, a handful of Seattle-area school districts have already sent letters to schools and parents assuring them that their schools are safe. Schools have made counselors available for staff and students. And teachers are checking in with individual students who may have felt targeted by the Trump campaign. At Cleveland High School, about 100 students walked out to protest Trump’s win. At West Seattle High, it was about 200. Mujaahidah Sayfullah, an Army veteran and Muslim American who served in Operation Desert Storm, was not concerned about Trump’s proposal to ban Muslims from entering America. But her two young children were. She said she was shocked at Trump’s victory — he proposed both the Muslim ban and government surveillance of American mosques — but at the same time she knew it was a possibility. On Election Day, Gabriela Quintana had spoken hopefully of the first female president and the progress she could make on issues like closing the Latina wage gap. The day after, Quintana, 48, a consultant for nonprofits and a Clinton campaign volunteer, said she was disappointed, surprised and horrified. Trump’s hard-line stance on immigration concerned her, even if she was dubious that he would be able to follow through on his promise to build a wall at the Mexico border. She worried about what her 5-year-old son would hear. She worried about the example set by Trump’s rhetoric, and especially about its effect on Muslims and Latinos. And yet, despite her demoralizing message, her voice was confident, upbeat. At a coffee shop in Rainier Valley that’s frequented by African immigrants and other people of color, there was a subdued atmosphere. People were talking about the elections, but quietly, without passion. His friend, Abebe Alemayehu, talked about his 8-year-old son, who cried much of the night. “I would rather see people wearing their Ku Klux Klan hoods so we would know who they are,” he said. But there were also many who offered consoling words. Anne Tilly was born in Bellingham in 1915, five years before women got the right to vote. She voted for Franklin Delano Roosevelt. She was an elector for Hubert Humphrey at the 1968 Democratic National Convention. On Election Day 2016, she could barely contain her excitement at Clinton’s historic candidacy. If Clinton won, Tilly didn’t have a big celebration planned. “I’ll just say a little Swedish prayer,” she said. “Tack sa mycket Gud.” Thank you God. But the next morning, she took defeat in stride. Seattle Times reporters Evan Bush, David Gutman, Caitlin Moran, Christine Clarridge, Nina Shapiro, Vernal Coleman, Katherine Long and Paige Cornwell contributed to this report.